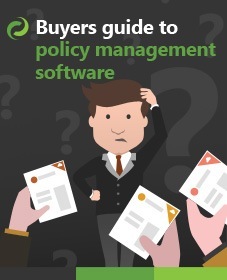 SharePoint Permissions can be complex at the best of times. After all, we have constructs like inheritance, group / user permissions, permission levels and so on. This post will attempt to tackle some of the security questions that you may have asked when dealing specifically with SharePoint Survey security and permissions. We will go through each of the categories and analyse what SharePoint Survey permissions relate to in terms of functionality. In this example survey, we have taken the default settings but have changed the Survey Settings > Advanced Settings > Read access option to – Read responses that were created by the user from default Read all responses. In a standard Team Site these Groups are generally created. 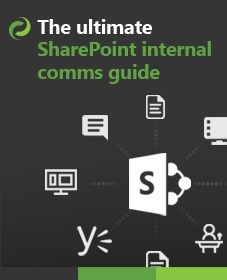 In the following sections, we will analyse each group and see what a user can and cannot achieve when in with a SharePoint Survey. 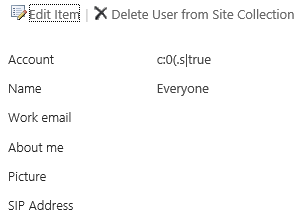 However if ‘Everyone’ isn’t part of a group then they won’t be able to see the survey or indeed any SharePoint site. (However, if anonymous access has been enabled then non logged in users may be able to navigate to the survey). If you want to use the ‘Everyone’ group then you can add it to a group with the relevant permissions. For example, if you add “Everyone” to the Team Site Members group then any logged on user will inherit those permissions. An Excel Services Viewer can access the site as a Visitor so they aren’t able to respond to the survey, while they are unable to view any results in the interface by clicking ‘Show all responses‘ or ‘Show a graphical summary of responses‘. As a member of this group a user will be able to respond to the survey, through the interface but they will only be able to see their own responses. (As we changed the default). If you wish any user who has responded to see everyone’s results then navigate to Survey Settings > Advanced Settings > Read access and change the option to “Read all responses”. In addition to being able to respond, a member of this group is also able to configure the survey settings and can also add questions. (This is because the group is given the “Contribute” Permission Level by default. However, under the “Advanced settings” they are not able to change the Item-Level Permissions compared. This is because they “Contribute” permission doesn’t have the “Manage Permissions” permission. In addition Validation settings, Permissions for this Survey are not available for a member compared with that of a Site Owner. (The reason that they are missing is because SharePoint “Security Trims” items that a user cannot access). 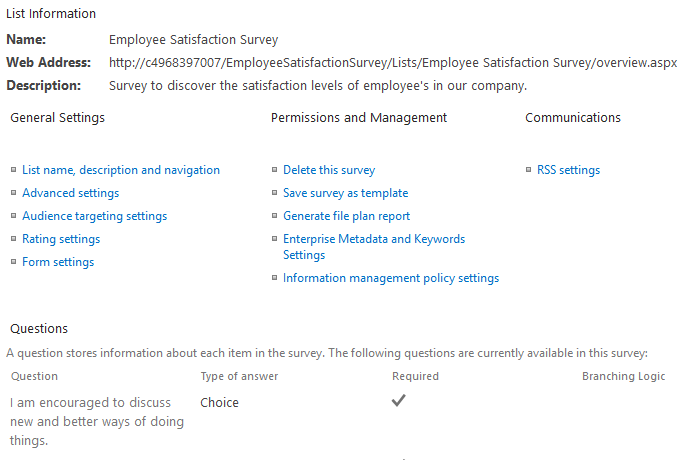 Notice how “Permissions for this survey” and “Validation Settings” are missing below. As a moderator you are able to respond to the survey, see all the responses and also access the settings of the survey. The Moderator is also able to alter the Item-level permission in Advanced settings something which a Member cant. Owners are able to create, edit and delete all aspects of the survey and have full control over it, they are able to change the Item-Level Permission in advanced settings like a Moderator can. As a visitor you expect to not be able to respond to the survey and also they can’t see the number of responses. while they are able to see the links to show all responses and also graphical summary, nothing is displayed. It is useful to set the ‘Read access’ and the ‘Create and Edit access’ prior to distributing the link. By default it is set to Read all responses and Create responses and edit responses that were created by the user. You may wish to consider changing read access to ones which were only created by the user. As a final note, if a user doesn’t have the relevant permissions to respond to the survey, they will receive “Access Denied”.